Early learning is social. And yet little kids are forced to navigate a “system designed by and for adults,” one focused mistakenly on delivery methods rather than the logic of how youngsters learn. To Erika Christakis, Lecturer in Early Childhood Education affiliated with Yale University’s Child Study Center, schooling and learning are two different things. This matters when three-quarters of preschool children now receive care at facilities and not from their immediate families. Young children are asked to conform to adult timetables for circle time, naptime, feeding, and so on rather than the other way around. In one study she cites in this well-researched book, 25% of Los Angeles kindergarteners were allowed no time at all for free play. Three and four year olds can make discoveries for themselves—sometimes Socratic ones that astonish adults—if given the mental space to do so and freed from typical classroom clutter and overscheduled activities. But too often teachers themselves are micromanaged by higher-ups, expected to hew to rigid lesson plans and given little flexibility. Small wonder they have little time to nurture relationships with their little charges. “Kids are being too much talked at rather than listened to.” This “crushes” their curiosity. By contrast, unstructured conversation allows “serendipitous learning without an agenda.” In German and Finnish kindergartens, for example, children listen and are listened to. They ask questions and get open-ended direction so they can find the answers. 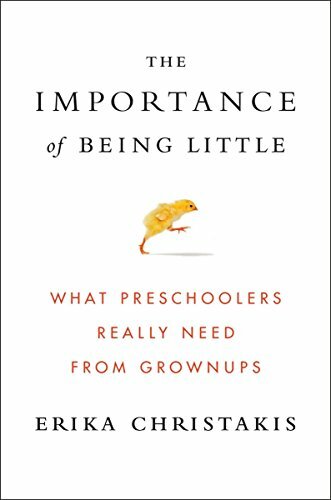 In America, reading, writing, and the cognitive demands that have been traditionally introduced in second or third grades have been pushed forward to preschool—to 3 year olds “who lack the motor skills and attention span to be successful.” Christakis argues that forcing academic rigor at such an early age has led preschoolers to do worse, not better. Many children are bored, less inquisitive, and less self-directed compared to earlier cohorts. They lack the verbal facility “to retell a simple story or to use basic connecting words and prepositions.” A disconcerting number are at a loss for what to do when faced with “free time.” Parents openly tell teachers that their children are “just not wired for play.” What she describes is the end of childhood as we once knew it. This misplaced focus is time stolen from hearing and watching adults talk to them, read to them, and play together with natural objects at hand like stones, leaves, and shells. It is time stolen from the practice they need to grow into engaged social beings, self-aware and socially and emotionally developing on a continuum of skills. It is time taken away from singing, nursery rhymes, and listening raptly to linguistically competent adults who engage them on their own terms. It’s the natural way that language, vocabulary, and literacy develop. Similarly, playing grocery store develops minds better than repetitive math exercises and “drill sheets.” She admires the philosophies of Waldorf and Steiner schools, which teach young children handiwork such as knitting or pottery “as part of and imaginative and story-driven curriculum.” Germany traditionally has Kitafahrt nature outings for children ages three to six. They sleep in tents with only their teachers and other children for company (no texting or helicopter parents allowed anywhere near for days). Such outings are meant to help youngsters become independent. They learn from nature and everyday experience, invent their own games, choose their own playmates, settle their own disputes. They learn to dress themselves, make meals, help one another. They pick berries in the forest and play with stones in the lake. At night they sing around a campfire.